Right, cards on table time. I am a Christian. But I have no truck whatsoever with missionaries who seek to convert. Equally, let me hasten to add, I take great exception to people not being allowed to convert if they so wish – which is a perennial issue here in India. My view is that the decision to practise one’s religion or not, to convert to another faith or not, is a private one, and that outside bodies have absolutely no right to interfere. So, having said that, let me share with you a tale of crass stupidity and ignorance and, in my opinion, western arrogance. A young American missionary has allegedly been killed by tribals on a remote island in India. He was trying to land on a tiny island, to which access is prohibited, intending to convert the inhabitants to Christianity. Sorry if I offend anyone, but what arrogance. Breaking the laws of India, getting the fishermen who took him there into trouble, and now presumed dead. “…wrote of returning to the island to continue his attempts at conversion even after a tribesman shot at him with a bow and arrow, piercing a Bible he was carrying. Yet again, sorry for offending anyone out there etc., etc., but what errant nonsense. As if the tribals, about whom next to nothing is known, precisely because there has been virtually no contact with them – as if the tribals, who are known to have killed other perceived intruders – would understand English. Didn’t this young man do ANY research before embarking on what appears to be an almost Indiana-Jones-y kind of escapade? Didn’t he read up about the isolation in which the North Sentinelese live? Didn’t he understand that they are hostile towards intruders? 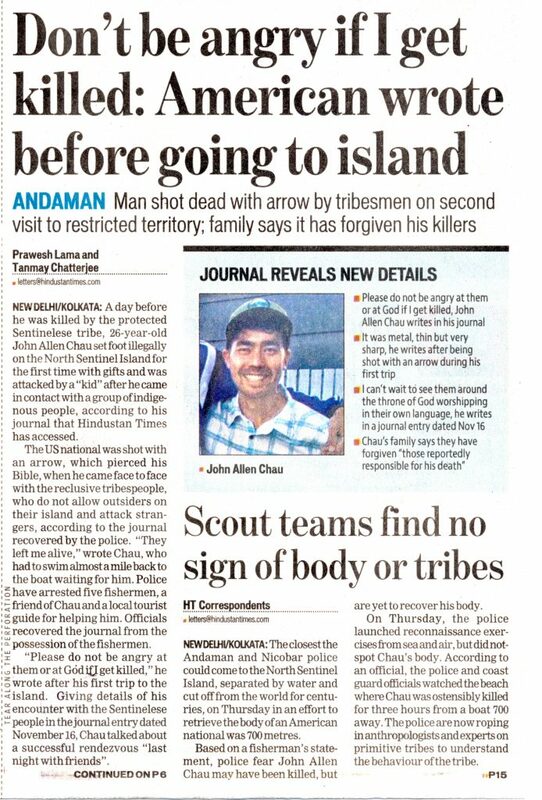 No-one knows for sure how many tribals there are, because no one has landed on the island, but young Mr. Chau, armed with his Bible, thought he could land and convert them. If that isn’t ignorance wrapped up in arrogance, then I don’t know what is. A sad end all round. Fishermen who helped him now in trouble. And a family back in the US grieving the loss of their child. A story with absolutely no happy ending. Y’know those people have no immunity to modern pathogens- Mr Chau could have killed them all with a runny nose. I have no pity for this young man. Thy will be done in earth, as it is in heaven. Matthew 6:9-10.